ON FIRE: Seven players from Softball FNQ have recently played at the National Softball Championships. Mila Bender played for the Flames Under-15s, Hirari Kurihara played for the Under-17s, James Minniecon played for Storm Under-15s, Moe Kurihara played for Queensland Heat and Mia Bender for the Fire Under-15s. 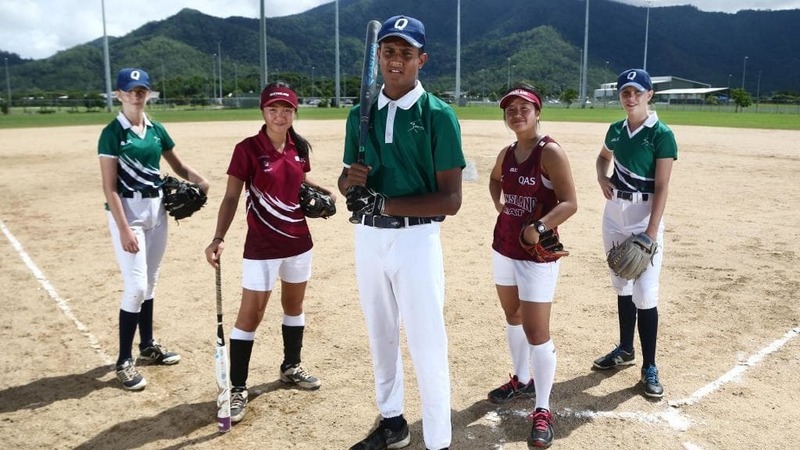 The right attitude, commitment to training and a willingness to put in the hard yards has spurred seven Softball FNQ junior products to state representative duties in the recent national championships. Softball FNQ secretary Liz Fresser said it was a “huge achievement” for a small association in a cricket-bent region to have such a large contingent of state players. “They aren’t just making up the numbers either — they are quality players that are having an impact on results,” she said. Fresser said it also had a lot to do with the kids themselves. “They are the ones willing to do the extra yards,” she said. Cairns 13-year-old James Minniecon personified a never-give-up attitude when called up to the Queensland Storm Under-15s Boys. After narrowly missing out on initial selection, Minniecon found himself in the team due to injury and, according to Fresser, made the most of the opportunity. “His team went on to win gold at the national championships in Canberra,” she said. Elsewhere, Mila Bender won silver playing for the Queensland Flames U15 Girls, while sister Mia and Syren Letizia lined up for the Queensland Fire U15 Girls and Hirari Kurihara co-captained the Queensland Heat U17 Girls. Former juniors Moe Kurihara and Jayme Reddacliff represented their state in the open women’s division, with Reddacliff going on to earn selection in the Australian squad for the Asia-Pacific Cup. Junior representative players will now wait to see if they made the cut to represent Australia at the International Friendship Series in Brisbane in July. The longstanding annual event provides Australian youth squads with development opportunities and experience in an intense, high-performance environment.